Evolution HUT cards are here! The EVO event is running from October 3rd to October 19th. If you’re new to HUT then you will learn quickly that these are the most valuable cards you can obtain… see how quick that was? If you want to know why then continue reading. *This post is presented by EA Sports Game Changers. If you’ve played HUT before, but not in 18, then you may remember Evolution cards as “Movember” or MOV cards. They were rebranded last year to Evolution to reinforce the fact that they evolve throughout the year. This also let EA focus their Movember theme on players who actually have great mustaches. They haven’t announced it yet, but if history tells us anything, expect a Movember set next month. 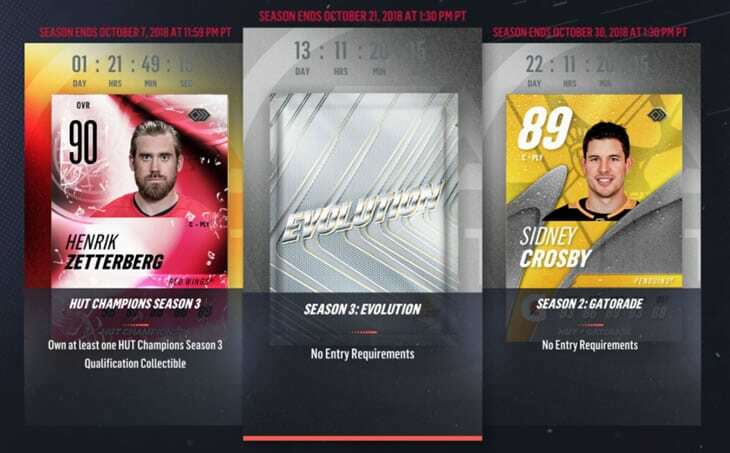 Back to Evolution, as stated above, Evolution HUT cards evolve throughout the year with every performance based upgrade a player gets in the game. So, you could pick up an 85 Nathan Mackinnon EVO now and a few months later it could be a 91 and worth even more. Of course, conversely Mackinnon could get injured in real life and receive no performance based upgrades, then you will have lost value. Prime Time: Based on single-game performances. If a player has a great night then there is a chance they could earn a prime time card. Milestone: Whenever a player reaches a major milestone they will receive a milestone card. Team of the Week: A team chosen based on the prior weeks performance. The team consists of an offensive performer line(gold), defensive performer line(gold), silver line, and bronze line. I highly recommend following iHaller(@HUTpredictions), if you want to know what upgrades to expect each day, he keeps an eye on the games and tweets them all out. Tip: A player can only receive a +2 boost each month, and they are limited to earning one of each of the above upgrades. 1 Prime Time, 1 Milestone, and 1 Team of the Week card per month, their first one will receive the +2 boost then the next two(if they earn them) will be differentiated by the synergies and card design. They may release other performance based upgrade types throughout the year. For example, every year that I’ve played HUT they have released Team of the Year(TOTY) cards around March and those have always been the most valuable cards; however, if you have an EVO card of any player that receives a TOTY then you will already have the exact same card except likely with less synergies. There are 35 EVO players in total and 30 of them are only available by completing the limited time Evolution sets. The other 5 are available from packs. There are 5 different tiers of EVO sets and completing each one will get you an EVO choice pack where you can choose 1 of 4 players from that tier. Each tier has 6 players so there is a chance your pack might not even have the option of the player you want, keep that in mind when deciding to complete the set or just selling your collectibles and buying the player you want. All the sets require Evolution collectibles. As you can tell in the video, I had a bit of trouble choosing 😀 I wanted Taylor Hall, but he wasn’t an option for me so I ended up going with Mackinnon and just selling him to get a Hall. Evolution Collectibles are found in all Evolution packs. There is a chance you may be able to get one from an Evolution Challenge Daily reward pack, but so far that hasn’t been confirmed. Participating in the competitive seasons is a great way to earn Evolution Collectibles without spending any money, depending on your skill level, you can win quite a few EVO packs. Struggling in Competitive Seasons? Follow ChelTips on Instagram for daily tips. Below I have created tables of the EVO players that are in each tier, so you can compare their synergies and attributes to help decide which one you want. If you want to compare any two players then I highly recommend using HUTDB’s Compare Player feature, the limitation is that you can only compare up to two players, so use the tables below to narrow down your decision to two before heading over to HUTDB. Above is the live EVO challenge at the time of writing this post. There are 13 different challenges throughout this event. You will notice that the final reward is a “Daily Reward”, so far it looks like everyone will get the same level of item. For example, if you get a gold common player from it then it’s likely everyone else did too, but a different player. I’d imagine that eventually the Daily Reward will be an EVO collectible and the challenge will definitely be worth doing when it is! There is a two-week EVO themed Competitive Season happening right now as well and the rewards are worth it! Remember that competitive season rounds are weighted to give more points in later rounds, so even if you haven’t participated in round 1 yet you still have a couple days to get a decent rank then you can more than make up for the late start by having a great round 2. If you place in the top 1000 you are guaranteed at least 1 EVO Extreme Pack. Not bad, those cost 2000 points to purchase or 100k coins. Placing in the top 100 will get you a Tier 1 EVO choice pack! Yes, that is the pack that could have Subban, Hall, or Mackinnon in it – you will be guaranteed at least one those 3 as an option. There are 3 Evolution Packs for sale throughout the duration of the Event. Extreme Evolution Pack: 22 items, including 16 player items(4 guaranteed NHL), and increased prospects of up to 2 Evolution Collectibles. Premium Evolution Pack: 12 items, including 7 player items(2 guaranteed NHL), and increased prospects of an Evolution Collectible. Mini Evolution Pack: 10 items, including 5 player items(1 guaranteed NHL), and prospects of an Evolution Collectible. As mentioned earlier, there are 5 EVO players that you can only get from Packs. Recapping the resources mentioned above and any others related to the event. HUTDB Compare Players Compare up to two players attributes and synergies. Of course, you can also create your team and look at any card in the game! HUTDB is awesome. iHaller @HUTpreidctions on twitter. iHaller tweets out all the upcoming performance-based HUT upgrades. /r/NHLHUT One of the most active communities around HUT on the internet. I follow it myself and you will often find the latest news and strategies being discussed there. @EASPORTSNHL The official EA Sports NHL twitter account. They announce new content. You can also follow EA Sports NHL on Instagram. ChelTips Instagram Daily tips and I'll often announce patches, tuners, and major content releases as well.